Cornell and Pennsylvania State Universities are conducting research on high tunnel production to help northeastern berry growers capture a larger portion of the market for fresh berries through season extension methods. This publication, along with its counterpart, “Greenhouse Raspberries”, (http://www.fruit.cornell.edu/Berries/bramblehtml/ghrasp.html) presents current data generated by this ongoing research. Greenhouse production of raspberries and blackberries has helped to bridge one gap in establishing all season bramble production in the Northeast. However, using this method alone to cover bramble production during mid-winter months may not be cost effective for producers, especially in the face of rapidly rising energy costs. Conversely, the same rapidly rising energy costs also provide a unique opportunity for expanding local and regional market shares over those currently held by imports. 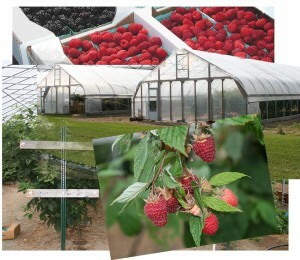 Furthermore, high tunnels allow less hardy floricane fruiting raspberries and blackberries to overwinter in climates where they would otherwise be killed. High tunnels allow primocane-fruiting blackberries to be produced where the growing season is too short otherwise to mature the crop. These technologies, coupled with the continued development of new varieties and field production techniques, bring the goal of all season bramble production closer to fruition (no pun intended!) for northeastern small fruit growers.